The minions are coming! The minions are coming! If your kids are anything like mine, you’re counting down the days (even minutes) until the opening of the new Minions movie. 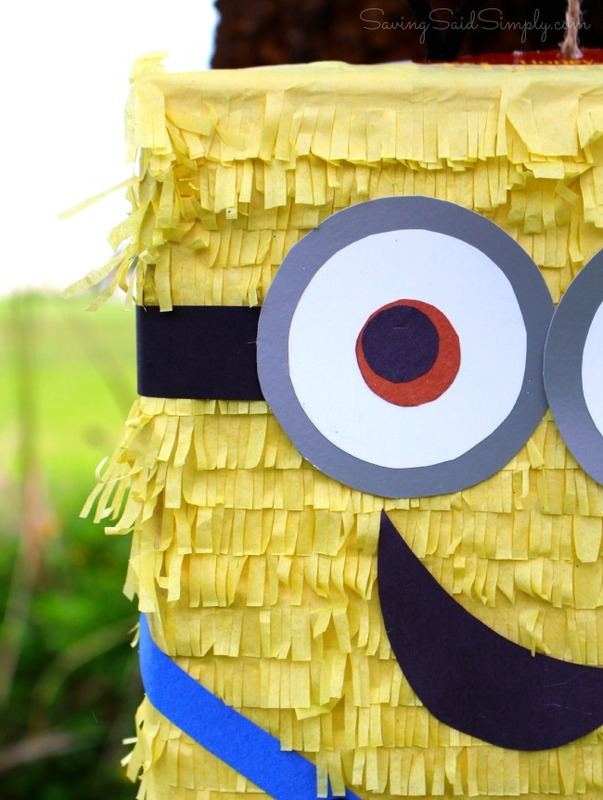 To celebrate one of the most epic movies of the summer, we made this easy DIY Minion Pinata for under $5. A perfect frugal party idea and summer activity, my kids are “busting” at the seams for their favorite little banana lovers. Are you ready to find the 7th Minion? I’ve always loved a good party pinata. But have you seen the prices lately? YIKES! $20-$40 for a pinata of your child’s favorite cartoon is not a justifiable cost for a crafty mom. I could do better. 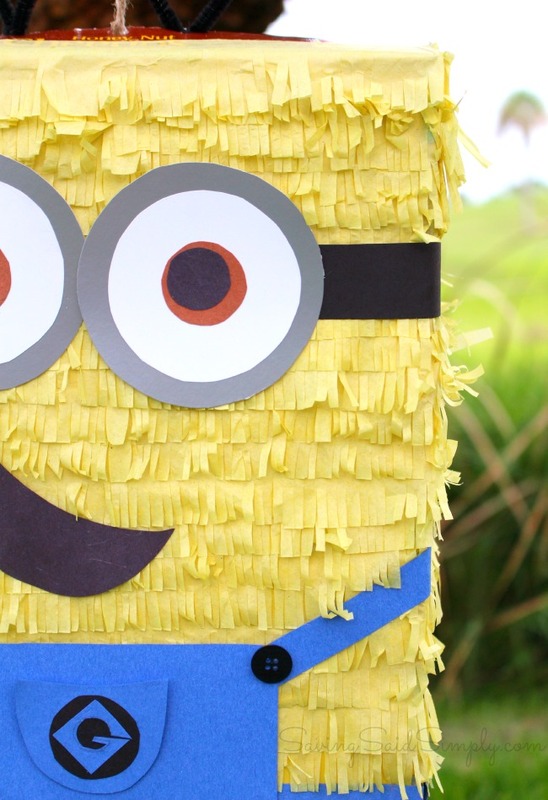 Inspired by the new Minions movie, we headed to Walmart for some pinata crafting inspiration. My kids have eagle eyes lately from anything that’s cute, yellow and minion-like. Can you tell that we’re excited for the new movie? I was stocking up on our family’s favorite General Mills cereals when those adorable minion eyes caught the attention of my kids. 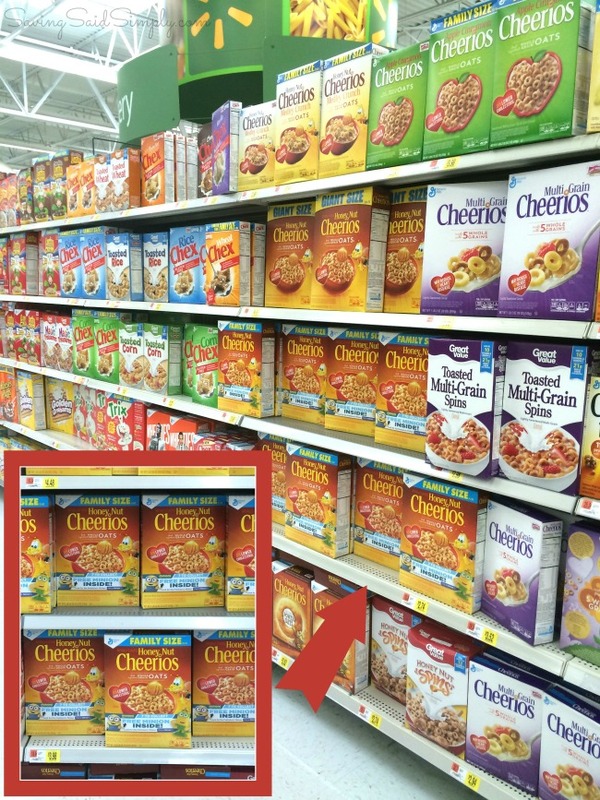 The minions have invaded the General Mills Family Size and XXL cereal boxes at Walmart. Remember those cereal box prizes from when you were little? Good times! So when the words FREE minion jumped out on our favorite Cheerios and Cinnamon Toast cereals, I knew these boxes were coming home with me. But what makes these gems even more special? The 7th Minion. That’s right, while most stores have 6 different free minion toys inside specially marked General Mills cereals, the exclusive Prehistoric Minion Toy (aka the 7th Minion) is only inside select Honey Nut Cheerios, Cinnamon Toast Crunch, Lucky Charms, Reese’s Puffs, Trix, Cocoa Puffs and Golden Grahams at Walmart. The hunt for the 7th minion was on! An extra large cereal box and a free minion toy? It’s like a crafting mom’s dream come true. I could work with this. And that’s how this DIY Minion Pinata came to be. A Minions movie combined with a summer boredom busting activity, how could we go wrong? 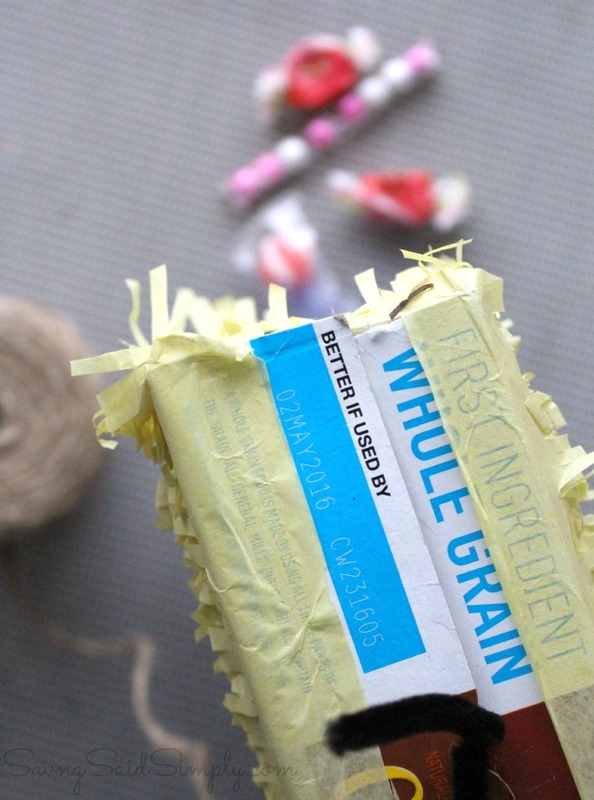 What I love about this supply list is that we could easily upcycle our XXL General Mills cereal box and combine lots of great crafting supplies we already had at home, making this frugal craft even better! 1. 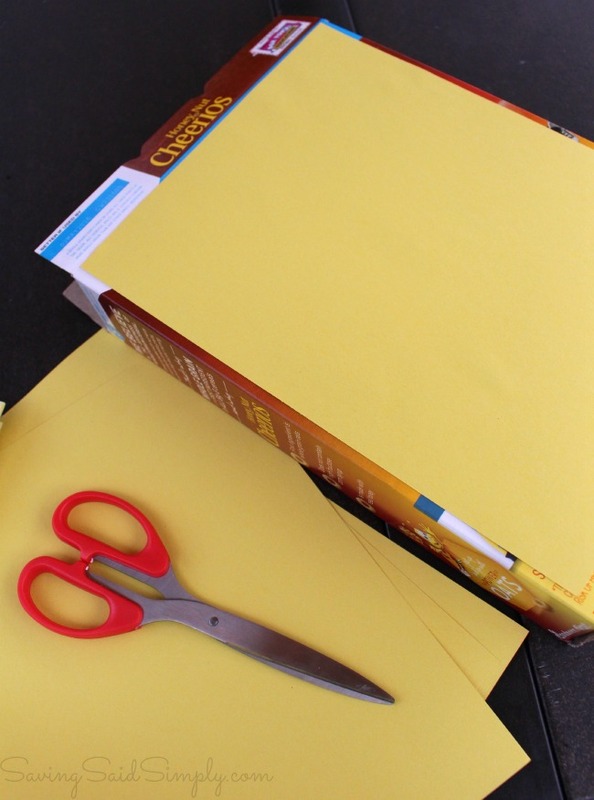 Glue Yellow Construction Paper to all sides of the cereal box. You want to cover any wording and colors so your minion will be brilliantly yellow! 2. Now we’re going to glue on the bottom portion of the minion overalls. Cut out a 2.5-3 inch high rectangle to cover the bottom of the cereal box on all sides. 3. Now for the tissue paper. 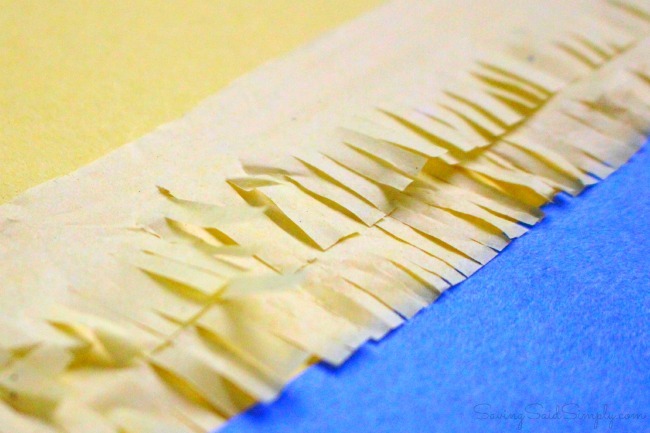 This paper makes all of the difference in a classic pinata, so don’t skip this step! 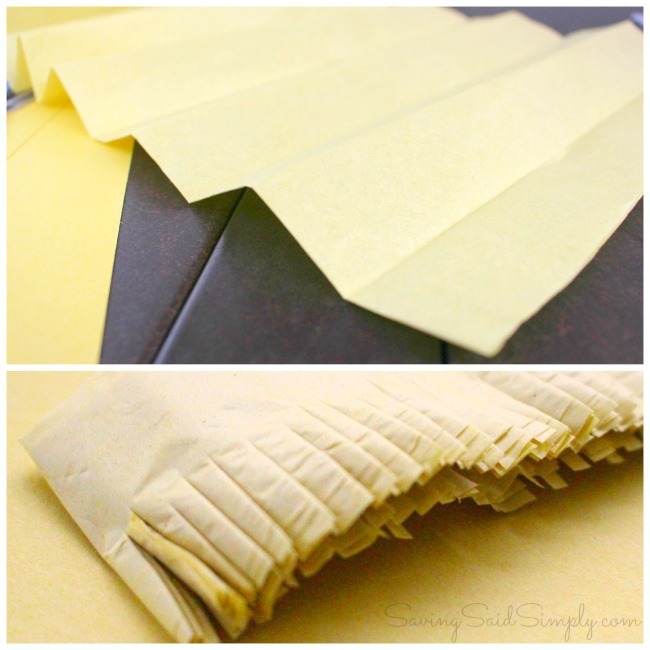 Stack your tissue paper together and cut long 1.5 inch thick strips of yellow tissue paper, the width of the cereal box. (Having a paper cutter would be really useful for this step, otherwise accordion fold the strips and cut with scissors.) Keeping the paper stacked together, then cut very thin lines into the bottom half of the strips to create the pinata fringe look. 4. 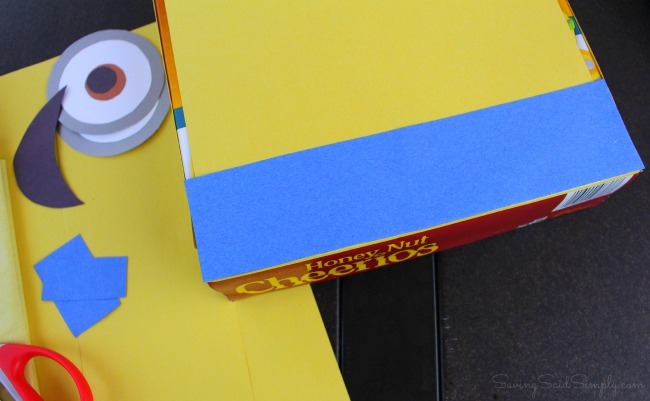 Start at the bottom of the cereal box (just above where the blue overalls stop) and glue the yellow tissue paper fringe strips onto the cereal box. Be careful in gluing so you don’t rip the delicate paper. Overlap the strips going up the box so just the fringe portion shows. Complete for all of the sides of the box. 5. Now for the eyes. Using a large circle stencil, trace and cut 2 equal sized minion goggles out of the silver plates, about 3.5-4 inches in diameter. Using a slightly smaller circle stencil, trace and cut out the whites of the eyes out of white construction paper to fit inside the goggles. Glue them in the center of the silver plates. 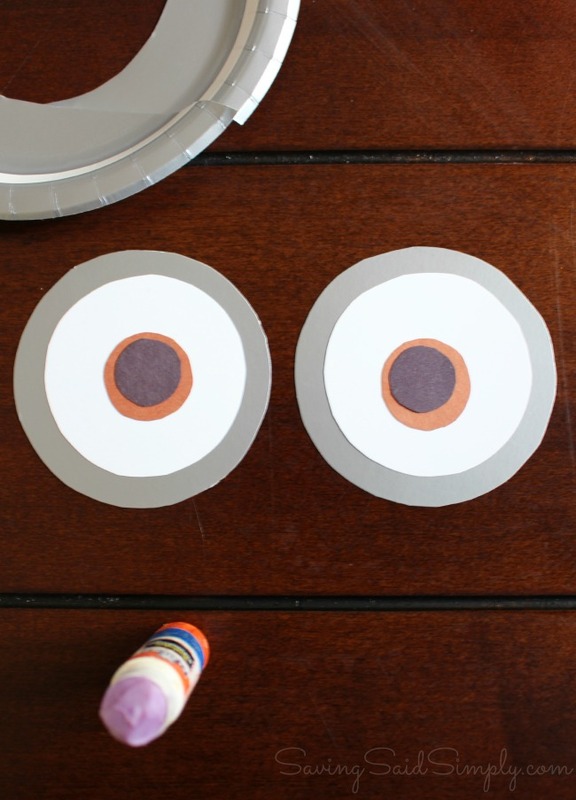 Make even smaller brown circles with brown construction paper and even smallest black circles out of black construction paper to complete the eyes. Cut out 2 long black strips to complete the goggles. 6. Cut out a cute little mouth out of black construction paper. I did a sneaky side smile. 7. 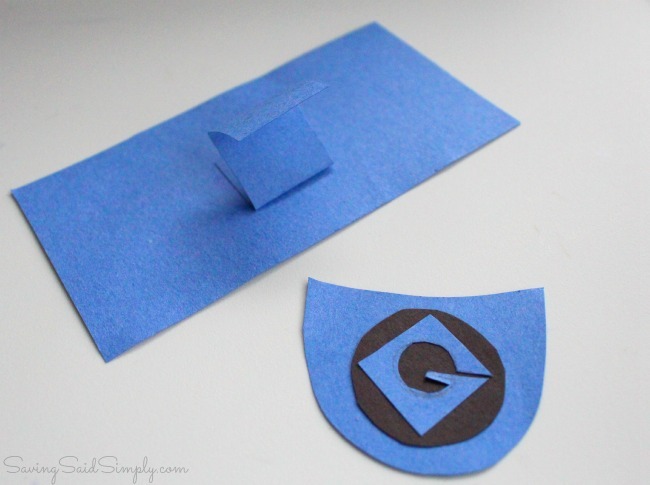 To finish the pieces of the overalls, cut out a smaller blue rectangle, blue pocket and black “Gru” emblem out of construction paper. I used an accordion fold on the pocket to get a more 3D effect. Cut two small blue rectangle strips for the overall straps. Get your black buttons ready. 8. 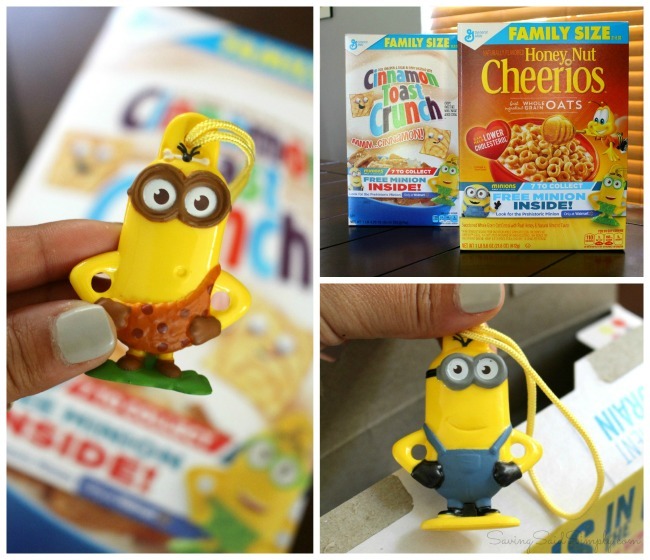 Inside the top flap of the cereal box, hot glue your pieces of minion hair (aka your pipe cleaners). Bend and arrange to stick up the top of the pinata. 9. Place your pinata filling inside the box. Because pinatas aren’t the same without fun goodies inside. 10. 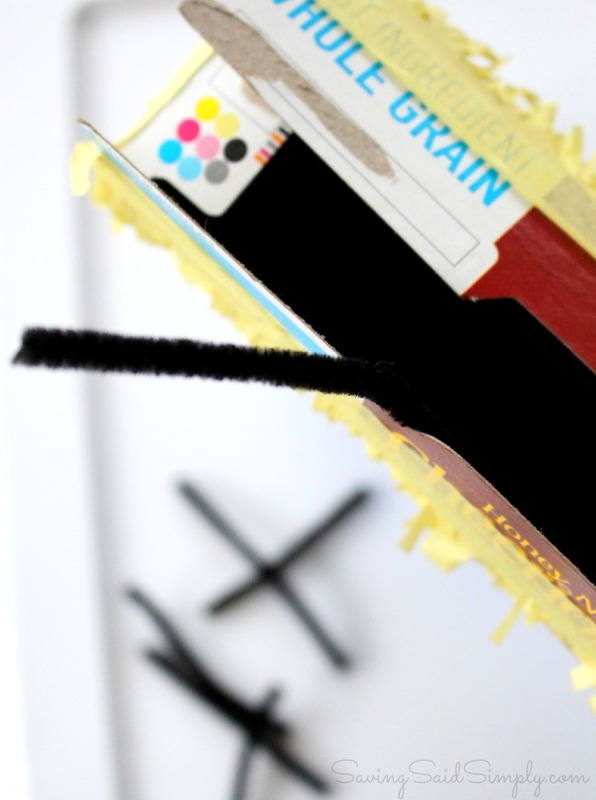 Now, overlap and punch out 1 hole in each of the top flaps of the cereal box. Make sure these hole line up correctly. Thread through your rope and tie a HUGE knot in the end. For double security, I also hot glued the rope to the inside of the box. Hot glue the top flaps of the cereal box down to hold the candy inside. 11. Now before hot gluing any of your minion eyes, mouth or overalls, lay out the pieces onto the pinata to make sure everything is kosher. Hot glue into place to look like shown. You’re ready for pinata fun! 12. Tie your rope up so the pinata hangs down, ready for action. 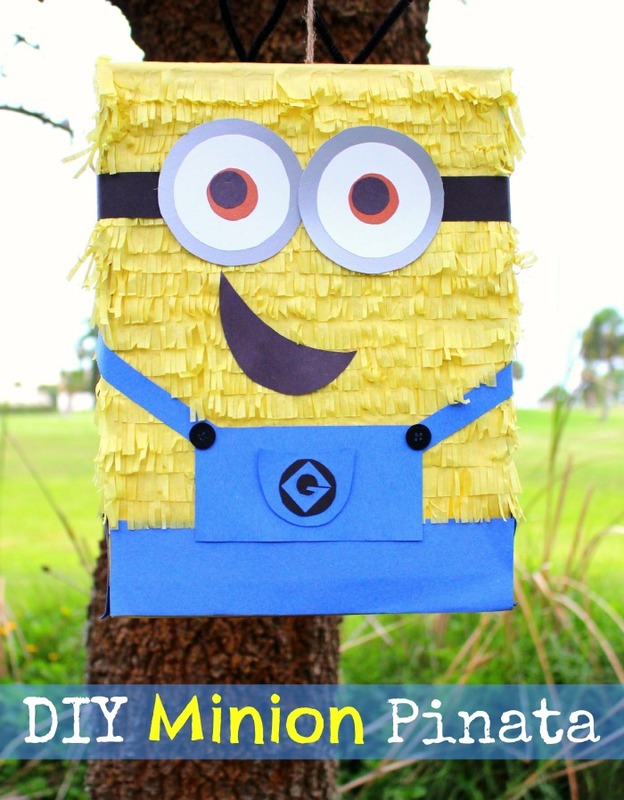 So whether it’s summer party time or playtime, the minions have invaded our home with this fun DIY Minion Pinata! Perfect for parties, get togethers and playdates, we can enjoy minions anytime! Make sure to pick up your boxes of General Mills cereals with the exclusive 7th minion at Walmart and create your own DIY Minion Pinata! My kids are still talking about when we can make our next pinata. For under $5, I’ll definitely be doing this again! Looking for more minion activities? Check out my Minions Kids Ice Experiment & DIY Minion Goggles Craft for more fun and inspiration! 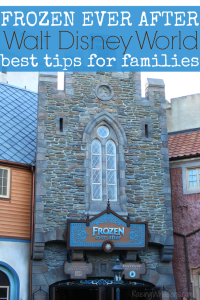 How are you getting the family ready for the new Minions movie? That is so cute! I love how easy it is to make, too! I remember making a traditional pinata. It took forever, and I couldn’t get the paper to stick! My kids can’t wait for this movie! What a super fun idea to celebrate! How fun! I love how easy it is to make! This is the perfect party favor for any little Minion lover. This is so cute and I like how easy it is to make. I have a girlfriend who would go nuts over this. Everyone loves the Minions. I was at a party this weekend where they could have used this DIY! I love the minions! My daughter is 4 and has never been to a movie in a theater. (She’s not a sitter.) So we’re going to try that one out and hope she makes it through. Loving this! I didn’t realize making a piñata could be so easy! What a fun way to celebrate the Minions 🙂 My grandkids would love it. How cool is this? My coworker is obsessed with minions, maybe I can make this and bring it into the office for a gift 😉 She would love it! Aww that minion is so cute! What a perfect addition to any Despicable Me/ Minions party! What an adorable idea and a great way to cut costs, especially when the kids will be tearing it apart within mere minutes. My kids will be seeing this movie with their grandparents. This is adorable! I think my older granddaughter could help make it for her little brothers. Thanks for this creative craft. Loads of fun! Pinatas add fun to any party! This looks easy enough and is so cute! Wow, you made that? That’s amazing! My son would love this – he loves all things Minions. Oh my! This is absolutely adorable! I want to throw a minion party now. This is a really cute craft. I love how you upcycled that cereal box. Thank you for sharing this craft. We’re not doing anything special to get ready for the new Minions movie. What a fun idea… love the minion. I bet I could convince our girls to help make that and we could have fun doing it. That’s a great craft. So cute and pretty easy to make. I got to attend a screening of the movie here in NYC but had no idea about the ‘7th minion’ in the cereal so thanks for sharing! I’m sure my nephews probably already know but I will keep an eye out for those! That is a super cute pinata! 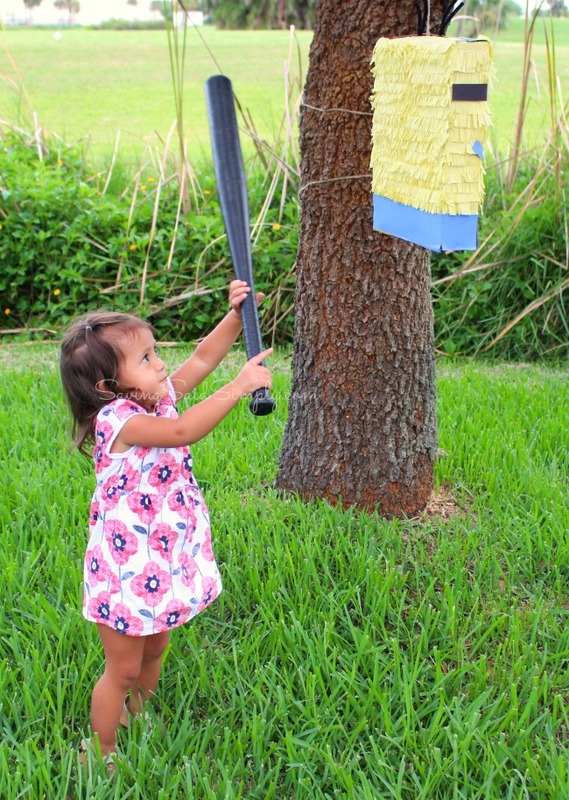 I never realized making a pinata could be so easy! Thanks for the tips! What a great idea! You’re right, pinatas aren’t cheap and this looks like you went out and bought one… no one would know it was a DIY from a cereal box. Love it! We can’t wait to see the new Minion movie, too! Oh how cute! What a really great,clever idea! I could make this no problem and my kiddos would LOVE it! How fun! I am going to the store to pick up some Lucky Charms. I hope we get the 7th Minion. Cute, cute cute! Love the Minions. 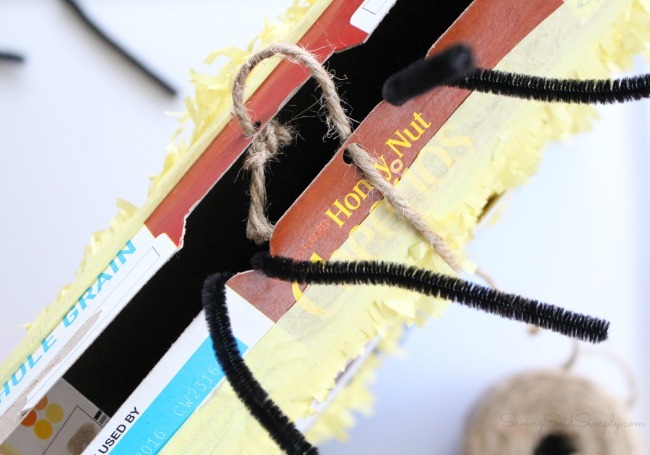 What a fun treasure to find in your cereal box and thats a pretty cool way to recycle the cereal box! What an adorable idea! We are Minion obsessed here!! I can’t believe you made that! You did such a great job, it’s adorable! We’re heading out to see the Minion Movie on Friday afternoon! 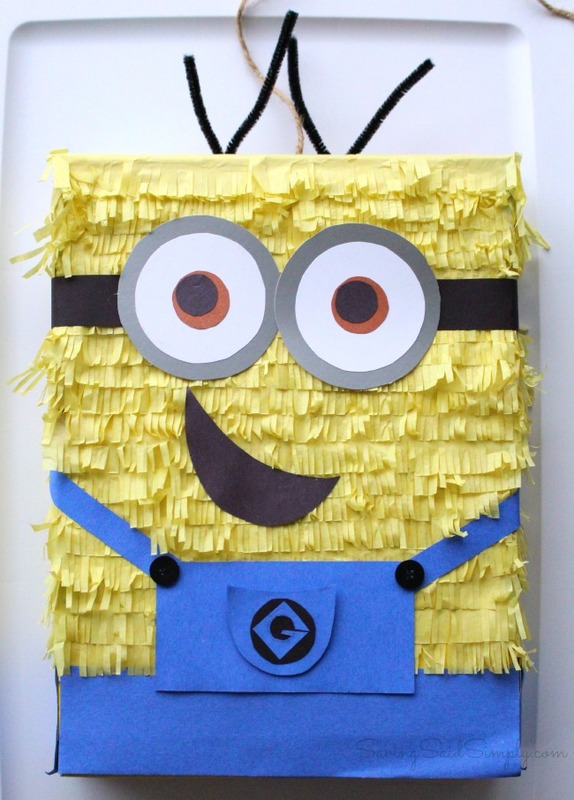 I bet my kids would love a Minion Pinata to celebrate! This is a great idea. The kids can make the pinata and then play with it at the party. Everybody wins with this one. This is a great way to save money. I think the Pinata is adorable!! 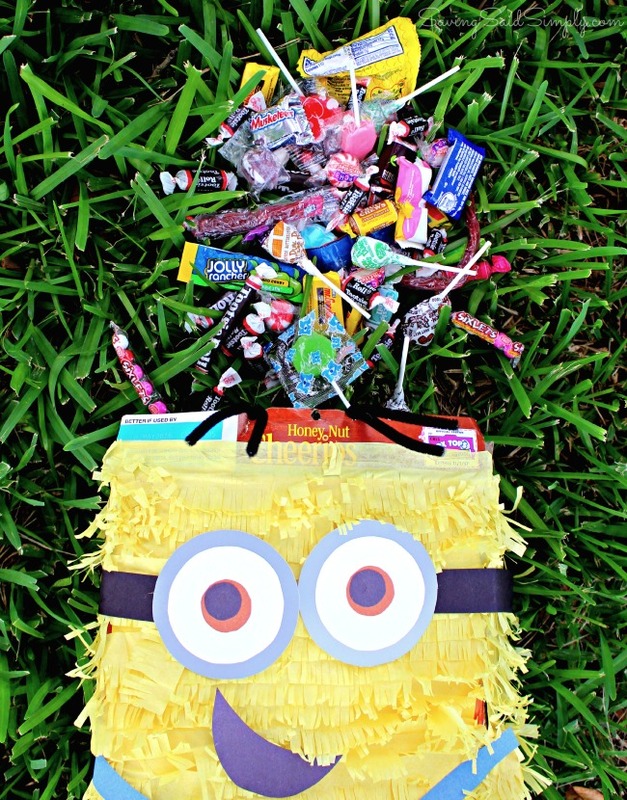 This is such a good idea to make your own Pinata and a Minion at that!!! You did a great job on that pinata!! So cute! That is so cute!! I have never made a pinata before but my son’s bday is next month and he’d love this! 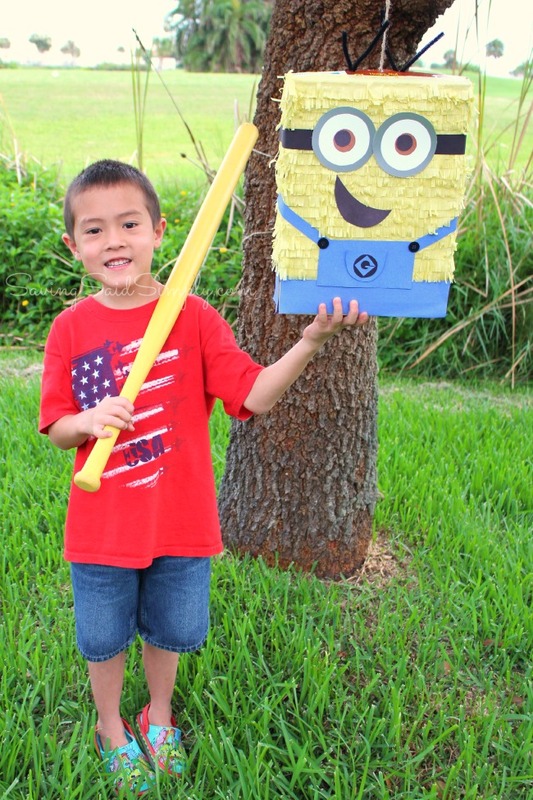 What a awesome idea, reusing the cereal box to make this cool minion pinata, sure to be a party favorite. Love this! So cute and I love pinatas! This is so cute. We may have to make one of these. The Minion is very popular. everyone i know loves the minions i will show them this ! 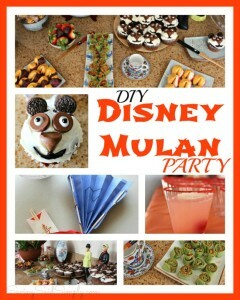 This looks so fun–I have some nieces that would love it! What a cute idea I love how it turned out. How cute! Are adults too old for pinatas? Oh my gosh this is too adorable! I love minions! This is great! I will definitely be doing this for the kids.